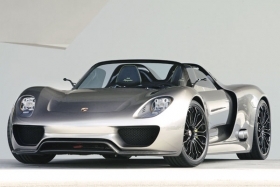 Porsche's first electrically powered sports car, the 918 Spyder, will be available in three to four years. STUTTGART -- Porsche is counting on hybrid drive to help reduce its fleet CO2 emissions. “In the future, we will have hybrid drive in every model line," development chief Wolfgang Duerheimer said. Earlier this year, Porsche launched a hybrid version of its Cayenne SUV. A Panamera sedan will go on sale with the Cayenne's hybrid technology in 2011. According to Porsche engine chief, Heinz-Jakob Neusser, the Panamera hybrid will be able to travel 5km to 6km (about 3 to 4 miles) under electric power. Porsche's first electrically powered sports car, the 918 Spyder, will come next, with small production runs planned in three to four years. “We want to learn how we can electrify all our sports cars in the future with the help of this short production run," Duerheimer said. He held out the prospect of hybrid versions of the 911, the Boxster and Cayman, but did not give a time frame. The European Union has set Porsche a target of reducing its CO2 emissions to 216 grams per kilometer by 2015 from 255g/km now. Porsche believes hybrids will help the company meet the goal. The company could also introduce smaller engines to help cut CO2 emissions. He is looking at turbocharging and direct injection. They could be used to transform a four-cylinder powerplant into a sports car engine. Weight is another parameter and Porsche aims to ensure that new models are no heavier than the vehicles they replace. "A constant weight is our minimum requirement in the change to a new generation, even with compliance with all the new safety and comfort requirements," Duerheimer said. That means a new model must be 10 percent lighter each generation, so that the new car doesn't end up weighing any more than the old. “You could hardly achieve much more than that with current technologies," Duerheimer said. He said Porsche is developing carbon car bodies for road vehicles that can be used to make another improvement of 50 kilograms (about 110 pounds) in weight. These could be ready in five years. Porsche is introducing new smaller vehicles such as the planned Cajun SUV, which will positioned below the Cayenne, to win new customers, not to cut the carmaker's CO2 emissions, Duerheimer said. "If you want to save on your heating costs," he said, "you don't move into a smaller apartment."